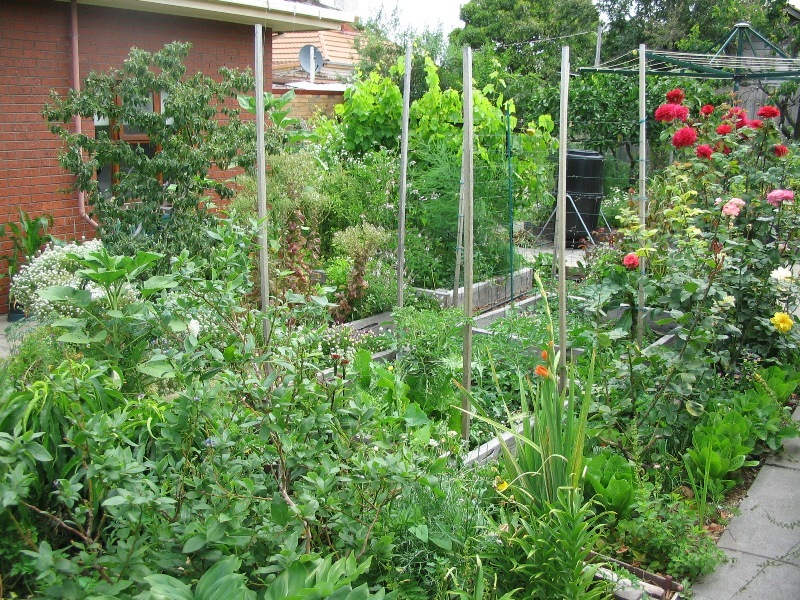 This section details the design and construction of my garden, which I can happily claim is the very first demonstration Permaculture urban food forest in Melbourne, Victoria, Australia! By “demonstration garden”, I mean that it is a proven working concept, from design all the way through to implementation. I do provide hard facts and figure for how much this garden produces (which you rarely find on many gardens) spanning the life of the garden since its creation, to prove my claims of how productive this garden really is. If it all looks pretty impressive on paper, or a web page, seeing is believing! Literally hundreds of people have visited the garden, as I open the garden regularly to the general public and to permaculture groups for garden tours and presentations, and the feedback is always that the work is inspiring, which provides further encouragement for me to do more and teach people how to do the same with their garden, which is the primary purpose of this website. This design proves that you can grow an intensive food forest in an inner suburban backyard, without pesticides, herbicides or chemical fertilisers, produce more food than you ever imagined was possible, with less water and less work, by letting nature do what nature does best, grow forests! The only difference is that we get to choose what goes into this forest, the types of trees and plants that we use. Just like a forest, it grows without all the usual chemicals and human effort, and it really can be done, and it does work. And here is the proof, read on and I’ll reveal how I did it! Here is a quick glance of the garden as it was at the end of 2008, a few months after I just finished building it. Click on the pictures to see the larger images. 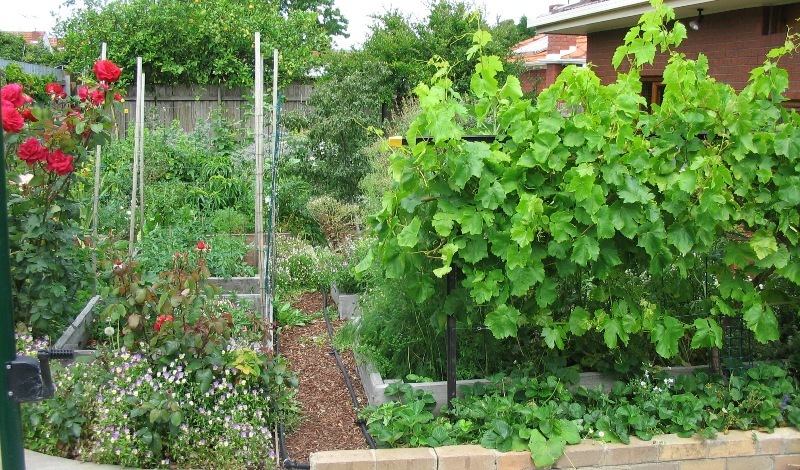 This garden was rebuilt as a demonstration project of what an urban permaculture garden in an average sized block in an inner suburb of Melbourne, Australia could produce sustainably and organically. The intention was to not use any chemical fertilizers or pesticides, to rebuild the soil (which was leached and lifeless) and construct a self-supporting ecosystem. I’ve used a range of organic and sustainable gardening techniques, such as no-dig, plant stacking, succession planting, composting, mulching, vertical gardening, companion planting as well as some modern design principles such as square foot gardening and backyard orchard design. Don’t think for a moment that this garden was designed to produce maximum yields of fruit and vegies to prove a point. There are about two dozen fruit trees packed into this garden (most of which are too young to really produce much at all), along with lots of berries, close to a hundred medicinal and culinary herbs, aquatic plants, and a wide range of ornamental plants, including flowers, scented plants, bonsai, carnivorous plants, cacti and succulents. This project was commenced in October 2008, and I will follow it through a whole year, taking you through each season, trying different techniques and plants, and seeing how it all goes. This garden took all winter (3 months to build on my own), is approximately 80 square metres in size, and you’ll see just how much such a garden can produce, and what we can learn from such a project, as we follow its progress from month to month. I’ve numbered each entry in sequence so you can follow it in chronological order. Hope you like it! I welcome any questions or feedback, so feel free to comment! Firstly congrats on a super garden. I’m slowly working on building up my own. I’m hoping you can offer me some advice on some problems I have. I’m in Forest Hill, Melbourne to give you an idea of climatic conditions – I have 12 Black currant shrubs (not sure of variety) but have been in the ground now for 3 years and I’ve never even seen a flower or fruit, were pruned as required in the winter – but are facing north,but I do get frosts. Can you help??? Also I note you have babaco – just wondering were you got yours from as it seems to have performed so well. Do you know where to buy good banana plants from & what variety do you think does best here? Now I bombarded you with questions….. I’m off to hill up my spuds!! Thanks for your feedback on my garden! With blackcurrants, be aware that they mostly fruit on last years wood, so, don’t prune them for the first year, and then only prune branches that have finished fruiting – that is just to stimulate growth of new branches. If your blackcurrant hasn’t fruited, there is no need to prune it, as you may be pruning away the fruiting wood! I got my Babaco tree from the GardenSmart shop at Gardenworld, 810 Springvale Road, Braeside (Melbourne), Victoria 3195. It’s a hydroponic shop, but the owner (and founder of the Autopot hyroponic system) has a real interest in food plants from around the world, and he’s often got some imteresting food varieties, including babaco plants. Babaco does well with phosphorus, so a bit of “blood and bone” fertilizer occasionally helps it along. Not sure about banana plants varieties suitable for Melbourne, I’ve seen dwarf varieties on sale, then again, I’ve seen full size plants growing in backyards here, against a brick wall, which helps retain heat on cold winter nights. They need all day sunshine and moisture, are heavy feeders and are sensitive to frost. Doing my PDC with a group of friends semi externally. We are enjoying your site. Thanks! Love your garden. I am just planing my own permaculture garden in a suburban area and hope it will turn out something like yours. I plan to start plantinting parennials in october. Will definatelly read your site befor start building. Even if I live in Europe (Slovenia) I believe I can use a lot of yours ideas. Keep up the good work. The great thing about the Permaculture approach is that it can be applied in all different types of climates, all around the world. It’s absolutely incredible what you have achieved with only 80 square metres of garden. I am just starting down the permaculture path and I have a whole acre to play with. Hopefully over the next few years I can do something worthy with what I have available. Your site will be very helpful. Thank you for all the effort you have put in to this site. This is very inspiring and makes me very excited to delve deeper into the world of Permaculture! I was wondering with the layout of your Apple trees- in a small space they seem very happy – is this at all possible with Citrus trees? My problem lies in the plumbing and septic on our small block in QLD which does not allow much in the ground planting. Hi Kate, citrus trees can be planted together and pruned to size. For small spaces they are very easily espaliered, or you can use dwarf varieties. Wonderful Angelo! I am off to the Nursery today to see what I can achieve. Expect to hear more questions as I progress through your site and Congratulations on what you have done so far, extraordinary! Angelo, you are an inspiration and your generous sharing of knowledge, wisdom and passion helped me with my PDC. Thank you for all you so beautifully gift to our world, your ripples are far reaching. I’d love to walk and talk with you in your garden one day., we are in the process of creating two Food Forests on our property in The Dandenong Ranges. Thanks for the great feedback Penne, you’re welcome! I’m delighted to hear that you’re building food forests in the Dandenong ranges, now that’s something to be excited about! Your garden project sounds like one I’d like to visit! Firstly, Thanks for sharing this amazing information with us. Great Work you have done with urban gardening. You’ve put in a lot of work and it shows. The way you’ve optimized the space and given it life is remarkable. Thanks! I’ll have to post some more updates soon. Angelo great job! You did something amazing, and you will inspire many people in the future to follow in your footsteps.I hope that we can meet one day and that you can show me your garden.Keep it up! Thanks for you guideline. I’m very interesting in gardening because of when I was in the garden. I feel comfortable and relaxing. Hope you have more article for reader. Very inspiring work. You’ve given me hope on my potted plants & fruit trees. I’m looking king forward to learn more. Is there a chance to visit your work in Melbourne? Thanks Mike, appreciate the great feedback! Hi Lisa, I would remove as much of the kikuyu grass as possible, it’s highly invasive and gets into garden beds. Plastic weed matting gets messy, jusy use flattened cardboard boxed, overlap them by 25% so there aren’t ant gaps the grass can push through, then cover with a nice thick layer of mulch around 5-7cm (2-3″) deep. Pour steaming hot water from the kettle over any bits of grass that push through! Do you still open your garden for visitors? Would love to visit it and learn more about the wonderful work you doing. I have started my garden according to permaculture principles in Maribyrnong 15years ago.I have more then 15 fruit trees all bearing loads of fruit. Since I have more time now am trying to expand my garden to be more self sufficient in veges as well. Would be delighted to show you around! Sorry I missed your garden open days in 2018. Will there be more open days in early 2019? Please let me know. Would love to visit your garden. Composting and worm farm and gardening.